This is the place to find lots of useful tips, articles, and resources to help you stay informed and healthy during flu season. Vaccines411 provides addresses and contact information for over 5,000 flu clinics, so you will know where to go for immunizations to help prevent the flu and other contagious illnesses that can spread during flu season. As well, we have gathered a variety of reliable resources and information on influenza for the flu season. 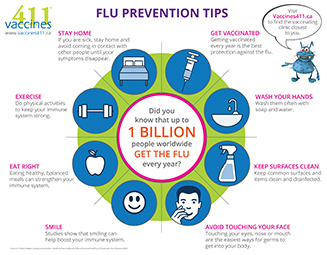 Click on the links below to learn more about influenza, including what causes the flu, how to identify flu symptoms, what can put you and your family at increased risk for the flu, influenza prevention measures, and tips for managing the flu if you or a family member catch it.